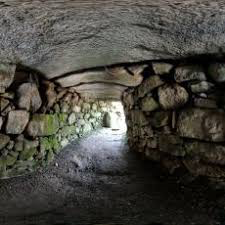 Fogous (Cornish for ‘cave’) are stone lined and roofed passages, often with additional chambers and passages, built in the late Iron Age, 500 BC. They are completely mysterious structures found only in the Land’s End Peninsula in association with courtyard settlements or enclosed settlements, although it is thought that they predate these settlements. Some are underground; others are above ground. Explanations as to their function range from storage, shelter to ritual purposes. They are almost always aligned to sunset or sunrise at certain times of the year, and research indicates that they may also have an alignment connection with nearby tin lodes.